Our recordings offer a self help approach to well being that can complement other strategies, approaches and treatments. Each comprises a carefully composed soundtrack and guided meditation. Our Self Help Audio can be purchased as downloads or as Audio CDs from our online shop. NB! They are not intended as a substitute for orthodox medical advice, and you should always consult your doctor on all medical matters and conditions. 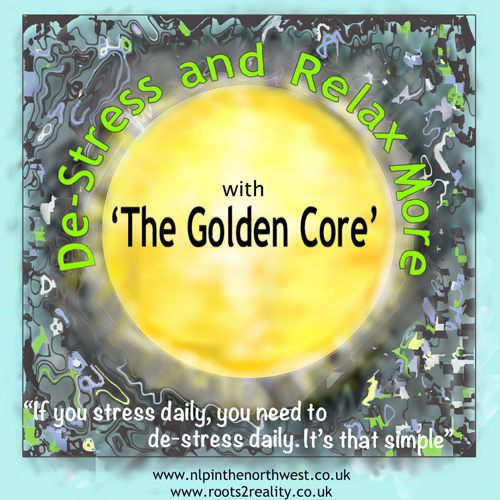 This audio programme is designed to help alleviate feelings of stress, encourage deep relaxation, and assist a growing sense of resilience. 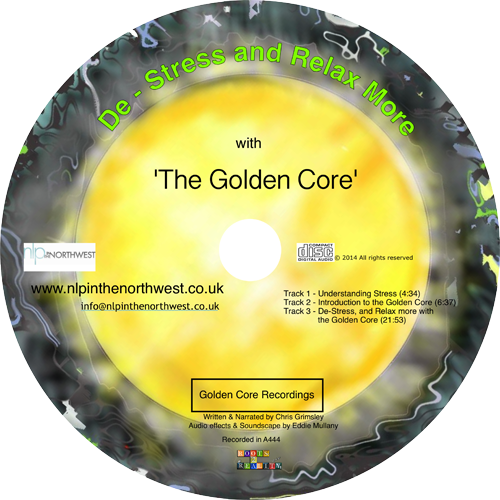 The main track combines deep relaxation and a guided visualisation reconnecting you to your ‘Golden Core’ – a metaphor for inner resources and potential we have had since birth, that help us to function at our best, and protect our inner self from harm. The relaxing qualities of the spoken words are reinforced by a carefully composed soundtrack. Click below to hear an audio clip from the recording. Eastern thought holds that there are centres called Chakras within our bodies that act as regulators of our subtle energies. 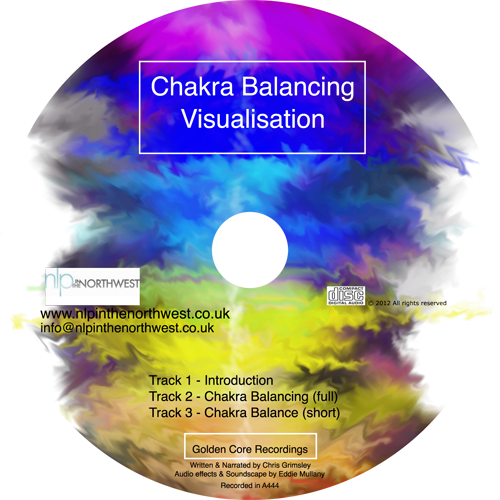 Located at different points throughout the body, each of the seven Chakras has its own attributes and influences on our wellbeing. 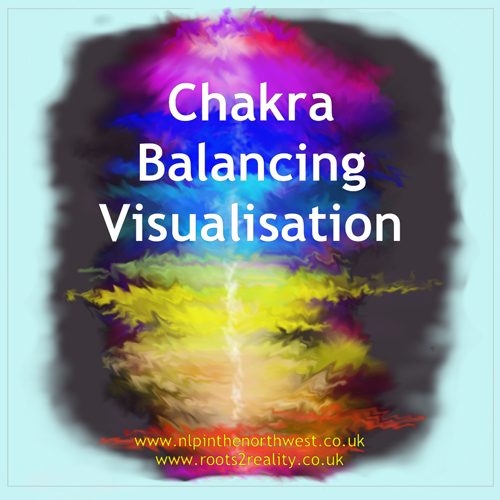 Like valves, Chakras open and close in response to our experiences, thoughts, and feelings. They can become blocked through physical and emotional upsets. When blocks occur, the disruption in the smooth flow of energy can adversely affect our functioning and wellbeing. This audio programme is designed to guide you to become more aware of these subtle energy centres, and to visualise aligning and balancing the flow of energies, in a way that supports you to be both grounded and connected. Click below to hear an audio clip from the recording. The effectiveness of a relaxed state and suggestion to change our perception of pain has been shown in many studies using MRI scans of the brain. It is now a recognised phenomena, and in many Pain Clinics. 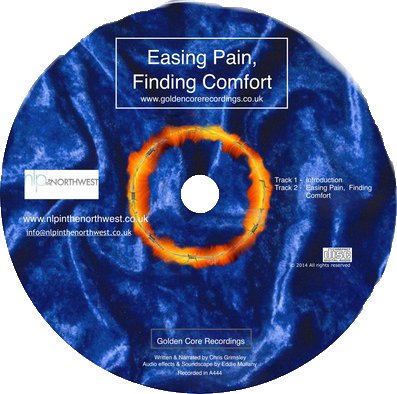 This recording is designed to help you to ease the experience of discomfort, pain, or other symptoms. 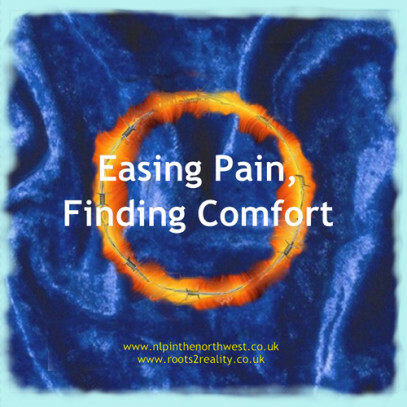 It takes you into a state of relaxation, and invites you to explore how you represent the discomfort or sensation that you have been experiencing. The recording then invites you to change the qualities of the representation, and to notice how this affects the experience and intensity of the sensation. The final section invites you to connect to a representation of a natural healing state of wellbeing that can be used now and into the future. The soothing qualities of the spoken words are backed by a carefully composed musical soundtrack, using frequencies reputed to have healing effects. Click below to hear an audio clip from the recording. 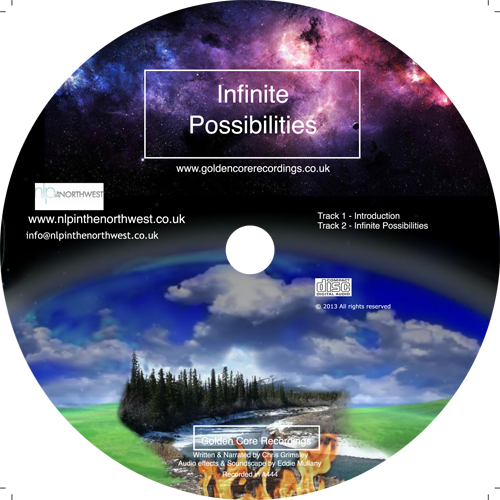 This recording is designed to help us to embrace a greater sense of possibility. 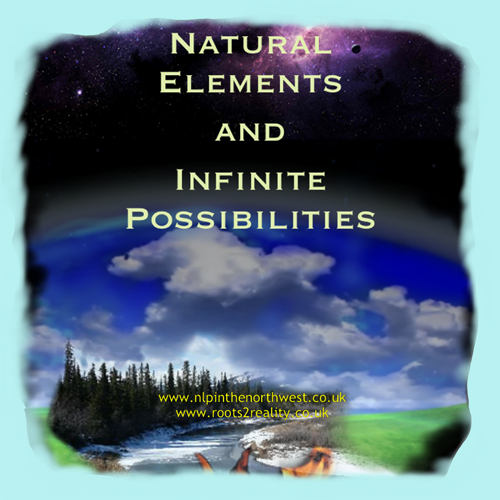 It takes you on a journey into your inner mind, connecting in turn with the natural ‘elements’ of earth, air, fire, water and wood, en route to accessing the Field of Infinite Possibilities. Here we can dream better dreams, access more of the untapped potential of our internal world, better open ourselves to a sense of what’s attainable in the outside world, and connect to the infinite possibilities of the universe and beyond. The spoken words are backed by a purpose composed soundtrack, incorporating frequencies reported to deepen relaxation. Click below to hear an audio clip from the recording.